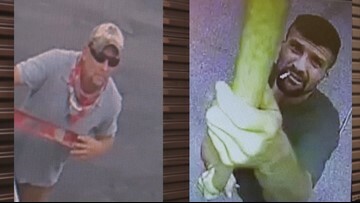 Bardstown police are looking for three people after several storage unit break-ins. BARDSTOWN, Ky. (WHAS11) -- There are more than 250 storage units at the Bardstown Stor-All on Pennebaker Avenue with 20 security cameras keeping a watchful eye over the property. But even with all the security measures, that does not stop people from trying to break in. "It does happen occasionally," Bardstown Stor-All manager Debi Goode said. "Most of the time there've not been items missing unless it's just one unit, and then it's turned out they were being targeted." But these recent break-ins are a little different. Goode said a man was captured on camera breaking into several storage units, targeting them not because of their owners or contents, but rather their locks. "He only targeted padlocks," she said. "All the units with the round locks were not touched." Goode said most of the people who rent storage space use the circular security locks, which are much harder to break than the padlocks, but Goode said some people do choose to use their own locks. Goode said she first received a call the morning of Sunday, August 12, from a tenant, alerting her to the break-ins. "She was upset because she had come up here to get some things out of her unit," she said. "The lock had been cut off and she had several items missing." In total, Goode found eight units that had their locks cut off. "Actually, a couple of units that were broken into, the people tell me nothing was taken," she said. "And then there were two more that was like what was taken wasn't worth turning into insurance." She said the man mostly stole tools from the units, including air compressors and table saws. "They were just targeting specific items that they were trying to find that they could resell," she said. She said the man, seen at one point trying to knock a surveillance camera, made several return trips after the first break-in on Friday evening. 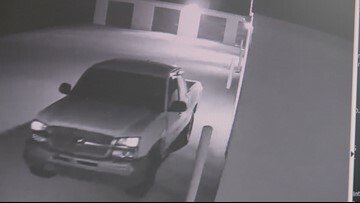 She said the man had also been spotted before the break-ins, his white Chevy 4X4 caught on camera about four hours before the initial break-in. "One of the tenants said while he was at his unit with his sons, this man drove by and was staring at them," she said. The man is just one of three people Bardstown Police are searching for in connection with several storage unit break-ins over the past few weeks. Bardstown Police said they have identified the suspects and hope they can recover the stolen possessions. Goode said people with storage units should try and check on their units at least once a week to make sure their locks have not been tampered with.